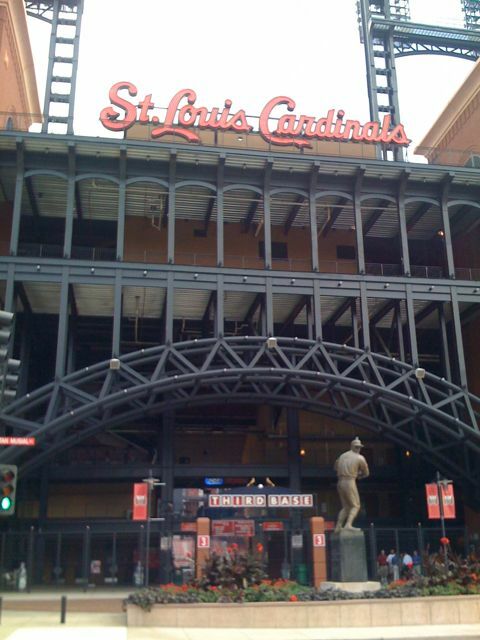 How do you get to Busch Stadium? Practice, practice, practice. Also, it’s a Metrolink stop. There’s a pretty cool museum in the basement at the Arch (a couple of interesting IMAX movies down there, on Arch construction and on the Western expansion) …and (at least a few years ago) when we did the trip to the top of the Arch I was quite taken with the ’60’s style “mod” motiff (thinking Mad Men here); it was almost kitschy…. Also, definitely check out LaClede’s Landing. Great old buildings, fun bars/restaurants. Check that. It may be underwater. And, Brian, I’m thinking the Arch basement is definitely underwater. I didn’t get to go to the famous Crown Candy Kitchen for ice cream when I was in St. Louis twenty years ago. Be sure to stop if it’s in your path and tell us how great it was. Not so much practice necessary this year. Gawd. Unfortunately there’s not a lot to see and do along the Metrolink route besides Laclede’s Landing. It cuts a swath between the airport and the river along the poverty scar of the city. Union Station is no longer safe, I’m afraid. Not even for a Detroit girl. Broadway Oyster Bar, not far from the stadium (and the bowling hall of fame) for seafood or something good to eat and jazz on weekend nights – super tiny, ground floor of three-flat. Soulard Market. It’s the in-laws’ hometown, where an uncle was once mayor, so I know the place well. And Jeff, Ted D. calls ’em concretes! (worth the drive – near the “Italian section” called The Hill). Gotta check out the arch because it’s Saarinen. Concretes are the original “Blizzards,” stolen by those felons at DQ (if you don’t know what Kim and i are talking about). Me, i go for the Heath bar Concrete — the counter girl has to flip them upside down in front of you before serving it up through the sliding screen. back in the early to mid Sixties, when my home town in SW Indiana was still populated, the entire Little League, all four teams, would load up in school buses at the end of the season and head down Highway 50 to a Cards game. Had my first soft pretzel there in, think it was 1965, and thought it was something exotic. Woulda been about ’65, ’66 i had my first Vienna Red Hot in Chicago, with poppy seeds on the bun, and i thought it was a gourmet treat . . . and was i wrong? Didn’t have a large soft pretzel until i visited my first shopping mall at a Hot Sams (next to the Orange Julius, if those still exist), which would have been more like ’72/’73. I lived in St. Louis for 23 years before moving to Chicago 5 years ago. Good old St. Louis, I miss it sometimes. I’ve mentioned this before on this site, when in St. L check out the Central West End and particularly a restaurant called Bar Italia, very nice outdoor eating area, good food, run by some Ethiopian brothers (remember Ethiopia was a colony of Italy). My big brush with fame in the baseball world of St. Louis is that for 2 or 3 years I lived in the same building as Lou Brock, I used to ride the elevator with him often. John McCain likes concretes too, Jeff. Not sure why this little story happened to stick in my memory. I think it was the image of the servers flipping the concretes upside down. Hahahaha . . . that was not why i brought concretes up, Scout’s honor. Joe Trippi has some ideas on how to beat McCain — http://joetrippi.com/blog/?p=2479 — and i think he’s more than half right. That, and pointing out the use of Optima font. I had business in StL once back in the late ’70’s. I remember the bar in the Holiday Inn. Somewhat. brian stouder • Jenflex • Mindy • Dwight • Jeff (the mild-mannered one) • Kim • Jeff (the mild-mannered one) • Dexter • basset • Jeff (the mild-mannered one) • Deborah • Jolene • Jeff (the mild-mannered one) • MichaelG • and YOU.